Note: Posaconazole, itraconazole and voriconazole may potentiate the effects of some chemotherapy drugs, thereby significantly increasing their toxicity. These drugs include vincristine and other vinca alkaloids. Broad spectrum antifungal agents, such as posaconazole or itraconazole administered prophylactically, can reduce the risk of severe invasive filamentous fungal infections in selected hosts who are at unusual risk of infection. The risk depends on both host conditions, which are defined in the table below, and exposure to fungal spores. There is minimal risk within the Bone Marrow Transplant unit itself, as it is HEPA filtered and spores are essentially absent. However, construction works outside pose a hazard that may be substantial, intermittent, and unpredictable to patients outside the unit. For this reason the choice and time of administration of prophylactic antifungal agents should be carefully considered for each patient in the current conditions, but a flexible stance should be adopted that is tailored to individual circumstances. Posaconazole is the currently funded fungal prophylactic agent for patients with AML and for patients on treatment for GVHD post-allogeneic SCT. It should be started 24 hours after the last dose of anthracylines if these are being used. A modified-release tablet is funded from September 2016 and is given as 300 mg PO BD for day 1 (omit if transferring directly from the oral liquid) then 300 mg PO ONCE daily. The tablet does not need to be given with a fatty meal. The liquid is administered in a dose of 200 mg PO TDS and requires administration with a fatty meal. If this is not tolerated, itraconazole 200 mg BD PO. For patients where the concern is predominantly re candidiasis, fluconazole should be used. The standard dose is 200 mg/day, though in allogeneic SCT without GvHD, consider 400 mg/day. 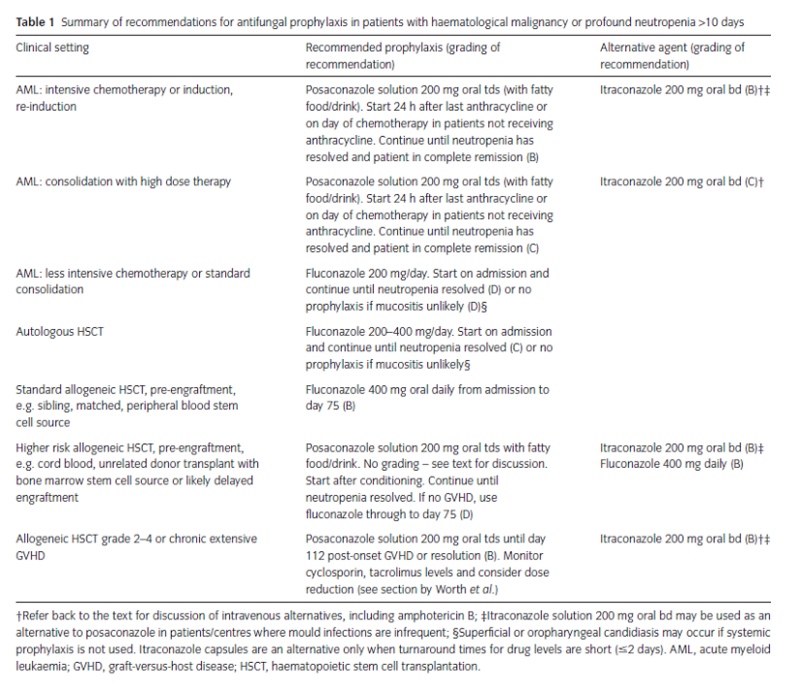 The review by Slavin et al in “Antifungal prophylaxis in adult stem cell transplantation and haematological malignancy” Internal Medicine Journal 38 (2008) 468-476 summarises the Australasian recommended approach to anti-fungal prophylaxis. If posaconazole is not tolerated, itraconazole 400 mg/day may be given in 2 divided doses (i.e. 200 mg BD PO). Itraconazole is available as syrup or capsules. Syrup has better absorption but it is considerably more expensive than capsules, and is less well-tolerated. A Named Patients Pharmaceutical Assessment (NPPA) application has to be filled out for outpatient prescription of the syrup, but not the capsules. Syrup should be taken on an empty stomach. Capsules need to be taken with food. Capsules require an acid pH and therefore are not absorbed if patients are taking antacids, especially PPIs (e.g. omeprazole). In this situation, it is recommended that the need for acid suppressants is reviewed and if they are still required that itraconazole capsules be given with a cola beverage (not diet). Monitor levels. If they are low with cola, change to itraconazole liquid and retest levels after 5 days. Mucositis, GvHD, and some intensive chemotherapy regimens affect absorption of the capsules. If levels are low, consider changing to the liquid preparation or another antifungal. Levels should be taken 5 days after the start of treatment. Trough concentrations should be >250 mcg/L for the parent drug, i.e. Itraconazole itself, and >1000 mcg/L for the combined parent drug and its metabolites. The aim of treatment should be at least to achieve satisfactory levels of the parent drug, i.e. >250 mcg/L. Itraconazole has a negative inotropic effect and has been associated with reports of congestive heart failure. Itraconazole potentiates vincristine (and several other agents) and may in this interaction lead to significant neuropathy. Voriconazole – This is only rarely used for prophylaxis as the pivotal studies were in the treatment setting. See treatment of Fungal Disease for further details of dosing, etc. Azole antifungals have many drug interactions that result primarily from their interaction with drug metabolising cytochrome P450 (CYP450) enzymes, and membrane transporters such as P-glycoprotein. Azole antifungals reduce the clearance and increase concentrations of many drugs including ciclosporin, tacrolimus, phenytoin, carbamazepine, benzodiazepines, calcium channel blockers, corticosteroids, statins, sulfonylureas, and oral anticoagulants. They are also substrates for CYP450 enzymes, and may have their own elimination affected by other drugs. Strong enzyme inducers such as rifampicin, carbamazepine, and St John’s wort may increase the clearance of the antifungal and cause subtherapeutic azole concentrations. Enzyme inhibitors such as isoniazid and ritonavir may increase azole antifungal concentrations. Refer to the Pharmacology guidelines in the Pink Book – Drug Metabolism and Transport for more information on interactions involving azole antifungals and CYP3A, CYP2C8/9, CYP2C19 and P-glycoprotein. Also note the other interactions (acid suppressants, vincristine, agents that have negative inotropic effects) outlined under itraconazole. Always check for any interactions with concurrent medications before prescribing and discuss with the ward pharmacist where necessary. Changes to drug therapy or dose adjustments may be required together with close monitoring. See information about drug interactions with voriconazole.